Before The Invisible Thread series I had never interviewed anyone on camera. I’ve had the pleasure of interviewing hundreds of interesting people for print but my voice, my words have only ever appeared on the page, and my image has remained hidden. Seeing yourself played back is an excruciating experience (how do actors cope with their overblown reflection at movie premiers?) and it revealed an irritating quirk. Whenever I start talking I experience an uncontrollable urge to wave my hands about. After I saw the first few interviews played back I gave myself a good talking to. Note to self: Keep your hands down. At all times. My hands would not listen. In subsequent interviews the second I started speaking up they would jump. Waving, waving, always waving. During one interview I tried to unobtrusively sit on my hands but I quickly released them. When I wasn’t waving them around I was unable to think. However it seems many authors are similarly inclined, so I’m in good company. Here’s Omar Musa and me waving at each other. My hand-waving was not the only challenge we faced. There were also a few technical misadventures. 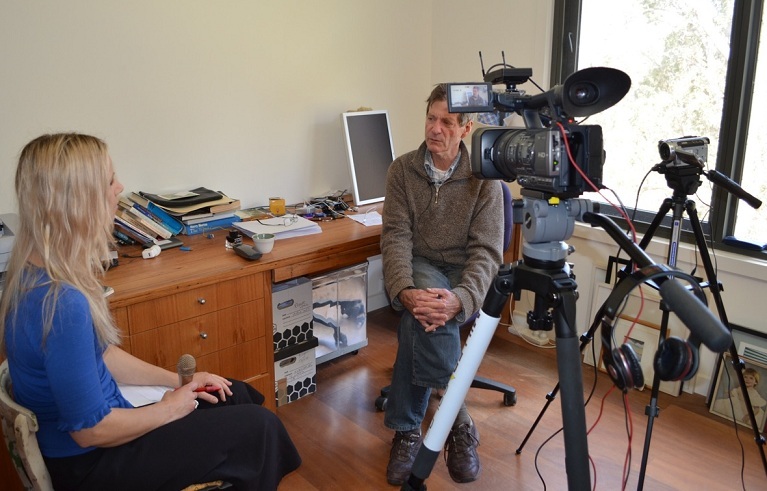 The ACT Writers Centre — where we filmed the majority of these interviews — was a logistical nightmare. Never has any room had so many plug sockets and light switches and poles, all highly unappealing features onscreen. We did our best to avoid them but early on one caught out my indefatigable cameraman, Dylan. During set-up my head was covering it, but as I began speaking and waving and moving around, the nasty little offender began playing hide and seek. When viewing the footage it was distracting in the extreme. I did show it to a couple of ‘test cases’ who didn’t notice it until well into the interview, but I knew we had to reshoot my noddies*. A right pain, but you can be sure we didn’t make that mistake again. Then there was the issue of the second mic. We had a reliable and professional lapel mic for the author but tried a series of different mics for me. So in a couple of interviews you’ll see me holding up a lovely gold number (disco queens eat your heart out). There was no issue with the sound quality but when the interviewer holds a mic it changes the dynamic, making it difficult to set the interview on an equal footing. So we swapped that for another lapel mic which, as it turned out, would have been perfect if we were working as spies but wasn’t so great for interviewing authors. It picked up everything in the room, and I do mean everything. On the playback I swear you could even hear the air moving. So finally we returned to disco gold but with me holding it between my thighs out of shot (as you can see here while filming Roger McDonald). Rather odd but somewhat less intrusive. But perhaps the crowning failure came courtesy of an author who shall remain nameless who deadbolted one of the doors after entering the room. The interview went beautifully, said author exited out of the second door and shortly afterwards, taking a break before the last author arrived, we did too, carefully closing it behind us to ensure that all Dylan’s camera equipment remained safe. When we returned, reflecting on how well the interviews had gone so far that day, we discovered that my key wouldn’t open door 1 (now deadbolted) or door 2 (which opened with a different key). While waiting for the security company, Dylan paced from door 1 to door 2 and back again, vainly trying them both at least 30 times each. ‘Stop, Dylan!’ I cried eventually, and he then attempted to convince me that I would be able to climb up through a high glass window above the door and drop ninja-style into the room. Needless to say I was somewhat reluctant, and thankfully we were unable to prise the window open. There was talk of breaking the door down; we weren’t ruling it out. Eventually the security man arrived and popped it open easily with a master key (I may have fist pumped, I can’t be sure). ‘The whole thing sounds Chaplinesque,’ a friend commented. Indeed. Now I’ve confessed all our misadventures you might be pleasantly surprised to discover that this week’s interview actually looks pretty decent. A writer and glass artist of Arrente, Chinese and Anglo-Celtic descent, Jennifer Martiniello has plenty of insightful things to say. Make yourself a cuppa, put your feet up, and click that little triangle. * For those as ignorant as I was, noddies don’t have anything to do with Big Ears or Enid Blyton. A ‘noddy’ is the technical term for when an interviewer’s questions are filmed after the interview has been recorded. We used two cameras for the majority of the series, but for the first few interviews we only had one camera and so after the author left I became adept at pretending they were still sitting in the chair across from me. On a searing blue-sky day my cameraman, Dylan, picks me up and we road trip to Roger McDonald’s home, just outside Braidwood. When we hit dirt roads we follow Roger’s concise instructions with landmarks that include sulky wheels and stock ramps. The landscape is like something out of a novel, a Roger McDonald novel perhaps. 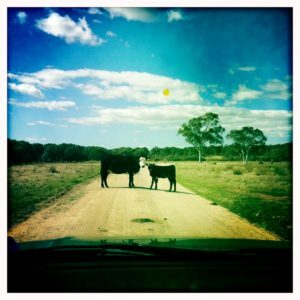 There is half a rusted car, a group of Clydesdale horses, and a pair of cows standing in the middle of the road who watch us approaching with disinterest. I have just finished telling Dylan that I don’t think I could live in the middle of the bush, and then we come upon Roger’s home. I immediately take it back. It is stunning, a building my architect brother would surely admire. Later Roger points me to a passage in his 1996 novel The Slap where he prophesied a ‘hand built’ house with ‘rammed earth walls and ironbark slabs, a wide verandah of stringybark poles and an atrium of heavy glass saved intact from the demolition of the original Hatton Holdings building, bought for a song in Sydney’. Stepping out of the car, Roger is already outside to greet us. Down the hill a little way a pile of wood is flaming. ‘It’s the last day we can burn anything,’ Roger tells me. ‘We’ve been chopping down some of the trees nearest the house.’ We stand side by side looking out at the landscape, the frogs chirruping. There’s something about the place. Its stillness instantly lulls me. I reluctantly conclude the interview. I could have asked so many more questions, but we’re trying to keep these interviews to a reasonable length. Roger offers us lunch—salad and an omelette with eggs from his chooks—but I am still tied to my feeding baby and we turn him down with regret. Instead he assembles a carton of eggs for us both and stands in the driveway waving us off. That night I crack the eggs with their luminous orange yolks and make a frittata. ‘These are Roger McDonald Eggs,’ I tell my kids. ‘Who?’ my daughter asks. ‘Roger McDonald. One of Australia’s finest authors.’ She doesn’t pause, pushing another forkful into her mouth. ‘Oh,’ is all she says. She’s so used to meeting authors that it doesn’t impress her much, but I think the frittata tastes particularly good. 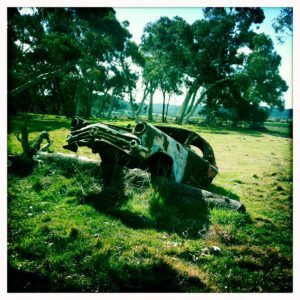 The Invisible Thread is an anthology of 100 years of writing from the Canberra region, edited by yours truly. Sharing the books you read as a child with your own children is an incomparable literary pleasure. But an even rarer pleasure is to share a writer who spans the generations. I read Graeme Base as a child and after three decades he is still publishing new books that my own children are now reading. So you can imagine my delight when I heard that he’d be at Paperchain in conversation with Canberra dynamo Tania McCartney. Graeme’s second book, Animalia, holds a special place in my childhood. In my memory it is somehow bound up with moving from England to Australia, a place that was brash and colourful and unfamiliar. The world of Animalia, pushed into my hands some time after I arrived, was also a book of discovery. Of strange words that thrilled the mouth. (Diabolical. Ingenious. Jovial.) Of intricate illustrations full of riotous colour, as potent as the new country I found myself in. Animalia is the book that made Graeme’s career and has now sold almost three million copies around the world. At the time he thought it was ‘a stupid idea’ but he’s grateful that the publisher didn’t insist on editing any of the language, and wondered aloud if the same would be true in today’s climate. He thought not, and I suspect he’s right. So often children are underestimated. The truth is, kids are big thinkers and their vocabulary can only grow if they’re challenged. Books (and publishers) that fail to recognise this irritate me. But Graeme never does that. When my eldest was four, Santa brought her Animalia. She’s a big reader but she didn’t take to it quite as I had, and I must confess I was disappointed. But later my son did, poring over its pages for hours, searching for the boy hidden on every page, interrogating me about the meaning of phrases such as ‘versatile virtuoso of vociferous verbosity’. Next I bought The Waterhole and together my son and I fell in love with it. A story of drought and the change wrought by seasons, it appealed to his keen interest in the world. We read it over and over until the hole became tattered around the edges. I think it actually overtook Animalia as my favourite Base book. The ladybugs’ speech amused me every time and we relished trumpeting the final animal chorus together ‘Ooola! Oooya! Wahoooo! (Yippee! )’, always smiling as we closed the book. Now Graeme has another book out, Little Elephants. Elephants are my favourite animal and these ones have wings. What’s not to love? It’s also the first book where humans are a real feature (‘The hardest creatures to draw,’ Graeme said). I meant to take photos of the evening but managed to leave my phone at home so you’ll have to content yourself with Graeme’s gorgeous scribble on my book. And I’ll leave you with a quote from James, Graeme’s son. When asked what his dad did for a living he replied, ‘Stays home and colours in.’ Now that’s a pretty good job. 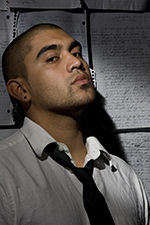 Chatting with poet, rapper and Invisible Thread author Omar Musa was ridiculously enjoyable. Omar is passionate, sometimes controversial, and always candid. During the interview he had his say on everything from artists leaving Canberra and then disowning their hometown to why (and how) he wants to dispel the myth that poetry is boring and irrelevant. At the time of filming, Omar was about to head off to the Melbourne Writers’ Festival to sit on a panel that included four women — most notably Germaine Greer — reading from their favourite poets. Surprisingly, Omar was the only panellist to choose a female writer. Chatting after the cameras were switched off, he worried that it would appear deliberate, when in fact the poet he had chosen, Anne Sexton, is one of his all-time favourites. You can hear him talk about Sexton’s influence on his writing in our interview, and a lot more besides. 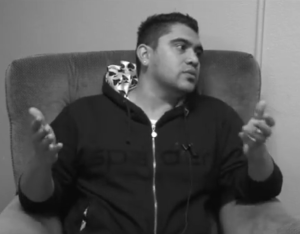 Keep watching until the end or you’ll miss Omar performing his poem (evidence of why he won the 2008 Australian Poetry Slam and how he could turn even the most reluctant reader on to poetry). Enjoy. I meet Jackie French at Floriade on Gnome Hill, a grassy area peppered with a collection of porcelain gnomes. We walk across to a quieter spot beside a stream. She has come from giving a ‘Gourmet Garden’ presentation where she has managed to splatter herself with soup. ‘I never wear an apron at home,’ she tells me, but using unfamiliar equipment she has managed to make a mess of herself. Not that the evidence remains. A bestselling author of children’s and young adult books, Jackie is also well-known for her books on gardening and cooking. She has published over 140 books in all, but today we are talking about Hitler’s Daughter, which is extracted in The Invisible Thread, an anthology of 100 years of writing from the Canberra region. On a gloriously sunny day we speak about Hitler and the nature of evil. One of the troubling questions Jackie poses her readers is: when you’re a fourteen year old surrounded by evil, how do you know it’s wrong? It’s the first time I’ve filmed an interview outdoors and this location presents multiple challenges. Before Jackie arrives, the cameraman, Dylan, tells me about the times he has filmed outdoors, entertaining me with stories of disaster, of intrusive drunks and unrelenting rain and teens desperate to get on camera at any cost. For us it turns out to be the buskers. We find a spot under a pair of willows away from the streams of people. Halfway through setting up the camera equipment we realise that a lady with pigtails and a pink tutu is preparing for a show just metres away. There appear to be fire clubs and ladders and head mics involved. ‘This is our spot,’ she tells me. On we move. Finding a location with a suitable backdrop that doesn’t intersect a walkway and isn’t overwhelmed by the pop music pumping from the main stage proves to be a challenge, but we succeed in the end. Setting up in our new location a dozen magpies decide we must be picnicking and strut boldly about our feet. When Jackie arrives Dylan mics us up and we perch on chairs that I’ve lugged from the car park, across the bridge, and through fields of flowers (next day I will feel as if I’ve been punched in the crook of both elbows). Despite her natural gift, Jackie tells me that ‘parents, teachers and guidance counsellors always pushed me away from writing. They always said no one in Australia can make a living being an author — do something else when you leave school. But every daydream, every time I envisaged myself as an adult it was as a writer.’ Jackie pursued a ‘sensible career’ and writing became a ‘private, guilty indulgence’ until one day money forced her hand. Her marriage had broken down and she was living in a shed in the bush with a brown snake, a wallaby and a wombat for company. She needed $106.46 to register her car and only had $72 in the bank. A friend, knowing she was an amateur writer, suggested she write for money. Using an old typewriter that she found at the dump, Jackie wrote her first manuscript. She submitted it to Angus & Robertson but it was so messy and riddled with errors that it was pulled from the pile and flapped about the office with laughter. They read it aloud, expecting it to be hilariously awful. Three weeks later she had her first publishing deal. I won’t rehash the interview here since you can watch that for yourself, but after the cameras are switched off we continue chatting. Jackie asks me about what I’m working on next and I tell her about my debut novel, which I have just finished, and my kids’ book, Megumi and the Bear, out next year with Walker Books. She offers all manner of invaluable advice. I feel as if I could chat to her all day, but eventually we part and I am left with the impression that Jackie French is possibly the most natural storyteller I have ever met. A version of this post was first published on Kids Book Review here.